This program echoes characters received from a terminal via RS232. The testboard K3 is set up with reset circuit, crystal oscillator at 4 MHz and a MAX232 for RS232 communication. The 5 capacitors connected to MAX232 can have a smaller value than shown in the circuit diagram, for example 1 uF each. If you use MAX232A or ST232, they can be 100 nF types. The 4 arrows in the circuit diagram indicate signal direction. The MAX232 is used for RS232 communication. 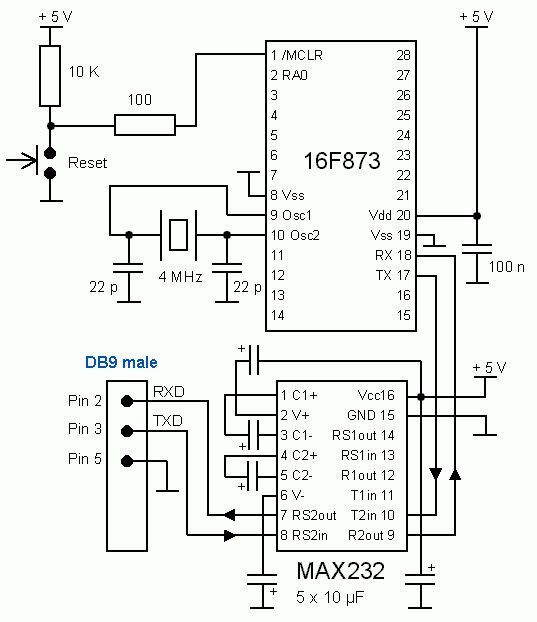 A simpler circuit can be set up using DS275, see the homepage of Wichit Sirichote from Thailand. A terminal program (HyperTerminal) is set up for 9600 baud with 8 data bits, no parity, no flowcontrol and 1 stop bit. The same program written in C is here. Download 873uart.zip containing the source code in assembler and the hexfile. Tony Nixon's UART test program at http://www.piclist.com/techref/microchip/16f877/setup.htm was my source for the above program. Thanks!